So we just moved and I unpacked my husband’s clothes for him (because I’m amazing). It was pretty easy considering he only owns a few essential hacker necessities. 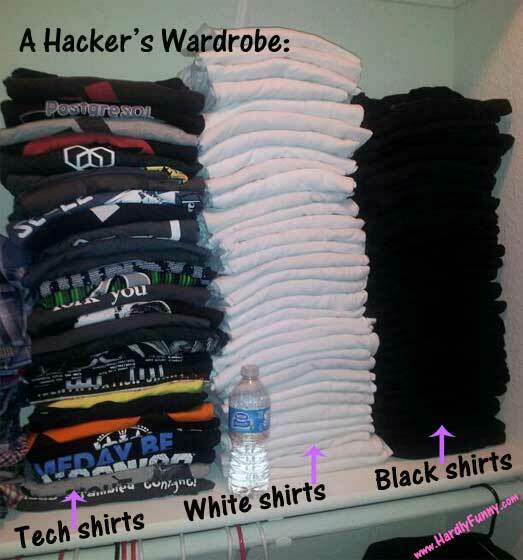 He has tons of tech shirts but usually opts for a black t-shirt. In fact, ever since we started dating, I told him that he reminds me of a cartoon character because he wears the same thing all the time. I like that he values comfort and simplicity but he needs to at least start dressing up for Halloween. This entry was posted in Posts and tagged home life by Samantha. Bookmark the permalink.